Well, perhaps explaining my absence here somewhat, I am very happy to announce the publication of my latest walking guidebook: Melbourne’s Best River, Bay and Lakeside Walks (Woodslane Press, 2018), which I have walked and written in conjunction with my favourite walking companion, Deb Heyes (for those of you who have had my previous guidebooks, she has very often been my patient photographic model – now turned author herself! ), which has been a great deal of fun. The new book is the first of a new 2-volume set for Melbourne – the original Melbourne’s Best Walks, has now sold some 10,000 copies, and we have decided to split it into 2 new books – one with a focus on water (this one) and the other on the bush, parklands and city (coming later this year). We have re-walked the original walks from the first book, and added 40 new ones. There are some real gems in the Water book – as always, Melbourne never ceases to surprise me with all sorts of hidden nooks and crannies. I hope you enjoy discovering them too! You will find the book (hard copy and e-book) available in all good local bookstores and online at places like Dymocks online or Angus and Robertson as well. Let me know what you think when you get on the trail? And since we are only about half way through the second one, let me know in the comments section if you have any ideas for fabulous walks you would like to see included. After the two Melbourne ones, we are heading further afield for the Grampians – watch this space for up dates! That aside – Ushuaia, at the very tip of Argentina, is the main port of call for all those Antarctic cruise ships heading south for iceberg adventures, and it definitely has the feel of a pioneer town – the Government attracts people to live here with massive tax breaks to compensate for its isolation. You can easily spend a few days here, though it is pretty expensive, wandering the shops, and up and down the hills (great for the walking legs and lungs!). A hire car will take you out and about to the national parks, lakes, the penguin island (in part 3), and the End of the World narrow gauge tourist train (which travels at less than walking pace, so it’s a good place to take in the National Park it travels through and zen out, but not a good place if you are in a hurry). My tip: try to avoid the first couple of trains of the day when in season, as you will be competing for your narrow gauge seat with the bussed out cruise ship folk on day trips. We were soon headed for our main goal – a cross-border zodiac crossing of the Beagle Channel (weather dependent) to make landfall on Chile’s Isle de Navarino – the southernmost-inhabited chunk of land in the world, unless you are aiming for an Antarctic base station: and the focus of much argy-bargy between the Argentinians and the Chileans – the good pope had to intervene at one stage to calm things down a little. Once we got through an unenthusiastic passport control at the port, the zodiac was a hoot – full up with a hoary sea-captain and 9 random travellers & hikers (including a couple of intrepid cyclists), and even though the weather was clear and still, the waves were impressive. Arriving on the island itself was surreal and beautiful – we were handed off and wandered over a dodgy gang plank to the only buildings we could see, and all hung about somewhat awkwardly amongst the cow pats, waiting for something to happen. After almost an hour, a minibus came roaring up the dirt road, and out jumped Mr Customs, who proceeded to check our backpacks most diligently, then pile us (and the bikes) into the minivan for a 40 minute drive to the tiny naval township of Puerto Williams. Another stop where we all handed over our passports and watched them disappear into a nondescript building, only to emerge faithfully another 30 minutes later, and we had officially arrived in Chile. The view from the Eco Lodge – north to Argentina. Not hard to wake up to…. Some creative woodworking along the trail up the hill – using the fallen trees where they lay to make bridges! No, I wasn’t drunk – the trees just get blown out of shape! Looking NORTH, towards the end of the world – Argentina’s ‘Fin del Mundo’, from ‘Beyond the End of the World’ – Isle de Navarino, Chile – it’s a sore point! Patagonia Wandering Part 3: Walking with Penguins! So here’s a quick and cheeky little post to cheer your day – our next stop on the Patagonian Express was at Ushuaia, at the very bottom of Argentina – its Tierra del Fuego (‘the End of the Earth’). Despite its claims to be the southernmost town on earth, my next post will fill you in on the Chile-Argentina argy-bargy over that claim to fame. But in the meantime, Ushuaia was a great stop-off for us to find our inner Attenborough and get up close and personal with some – well, a lot of – penguins. This was the one paid day tour we did on the trip and it was worth every single penny. the island is part of a private ranch, Estancia Harberton, a research station where they collect and study washed up marine skeletons (think whales and dolphin skeletons which apparently all end up circling the currents around this bottom end of the world like some big bone graveyard, and end up washed up on the ranch’s beaches!). Two small groups of tourists are allowed to visit the penguin colony each day, via a zodiac boat. then you get to just hang out with the thousands of Magellanic, a few rare gentoo and even a pair of emperor penguins, all of whom just ignore you and do their own thing. What an experience. When your kids are bigger than you are, time to help them leave the nest – literally? Oh – and PS, we visited some champion dog-sledding huskies before leaving Ushuaia as well. That was about my full dose of cuteness for the whole year. The spectacular ‘shiny’ granite peak of Cerro Torre in the Mt Fitzroy massif, taken on the long walk up through the Rio Blanca valley. Well, it’s taking me a little while, but am getting there – the next big stop on our Patagonian adventure after Torres del Paine, was to head by bus from Puerto Natales, into Argentina’s tourist town of Calafate (quick day trip to the spectacular Perito Moreno glacier) and then across the border via the iconic Route 40 to the amazing walking in and around El Chalten. Just a word on Patagonian buses: they are fast, clean, affordable, regular, on time, comfortable, and have free wi-fi! We based ourselves for 5 days at the low key outdoors-focussed climbers town of El Chalten, set smack in the middle of the Los Glaciares National Park. With a very cool but unselfconscious frontier vibe, this was a spectacular part of an already spectacular trip – even the view from the bathroom of our little flat was of the beautiful peaks of the mountains (we stayed at Apart el Cabure and I’d recommend it – just 3 little low key local flats, around USD$50 per person per night for 4; warm and good hot water, and super lovely and helpful owners). Somehow, the cloud gods were on holidays on the day we chose to hike up to the peak, and we were blessed with beyond perfect weather – mild, sunny and not a breath of wind. Apparently this is pretty rare – or so everyone told us. But as you can see from the pics, it really was impossible not to be gobsmacked every which way you looked. The canon-shot of falling ice cracking off this hanging glacier was deafening across the valley on the hike up. Take a quick tip from me (which we took from the owners of our accommodation) – fork out for the bus which takes you up the valley from el Chalten early in the morning for about 40 minutes, so you can take the less trafficked, more gradual and absolutely beautiful walk beside and above the river through up to the Poincenot campsite at the base of the massif. It’s an alternate walk-in instead of constant 4-hours of steep uphill direct from the township. Your knees and lungs will love you for it. This way takes you through mossy Antarctic Beech forests and above roaring rivers, and also has curious signs that basically say ‘run like hell if there is a fire’ (because apparently you have to be told!). If you have it in you, when you get to the base of the Cerro Torres (Mt Fitzroy’s towers), on the other side of the campsite, where climbers camp overnight before tackling the towers, there is a hell of a final steep rocky switchback slog, gaining another 400m in altitude, up to the famous Laguna de Los Tres glacier lakes above. Worth every bit of blood, sweat and tears, according to my Duracel-bunny-like buddy, Deb and her loping son Tas, who made it look like a Sunday stroll. I meantime sat at the now tiny Rio Blanca at the base, and just took it all, in blissful peace. The extraordinary shininess of the rock towers is apparently caused by the repeated frosts, sluicing off the surface of the rock over millenia. Whatever it is, it’s spectacular. I can’t believe it’s been two years since I have written on my blog – how disgraceful! I don’t want you to think I haven’t been walking in all that time, as in between life-as-usual, I have actually done some really wonderful walks – I celebrated my 50th on the Larapinta Trail – unbelievable! ; did a multi-day walk on the Ridgeway in the UK; have done some lovely walks around Victoria, including some of the Goldfields Track (my next aim! ); walked the Portuguese coastal camino with my daughter, and have just been lucky enough to return from Patagonia – a decades-long dream to walk the Torres del Paine. And importantly, finally, at the end of last year, my 4th guidebook, Best Walks of the Great Ocean Road, hit the bookshelves. So I clearly owe you a bit of catch-up – let’s see how I do! – and hopefully hear about some of your walks, too. Patagonia – the southernmost areas of Chile and Argentina – was my first venture to South America, and it won’t be my last. What an incredible 4 weeks, and so easy – bus transportation is fast and comfortable, food is good and plentiful though it helps to like copious quantities of red meat, people helpful and the walking is spectacular! The 106km ‘W Walk’ around the Torres del Paine massif in Chile has been on my bucket list since I first saw a photo of those incredible spires 20 years ago. And it did not disappoint at all. A long flight from Melbourne to Santiago, then to Punta Arenas and then a bus to quaint Puerto Natales and yet another bus into the NP was rewarded with a magnificent refugio-to-refugio walk in pretty amazing weather (we were very lucky!). We did the walk independently (very easily) using a local Chilean travel agent to book the refugios and connecting transport, which was very easy and saved us huge wadges of cash. The refugios are clean – have rooms with multiple bunk beds (If you prebook you can get the lower ones – some are pretty vertiginous! ), hot communal showers and can be pre-booked with linen so you don’t have to carry heavy packs, and full board – evening meals are hearty 2 courses and will line your stomachs – and lunchpacks consist of (huge) slabs of bread with meat and cheese and a muesli bar and fruit. For those with more stamina and who are seriously pack-fit, there are excellent camping grounds beside all the refugios. The walk itself is not technical, only reaches altitudes of around 1200m, and the trails are relatively clear except for a bit of rock scrambling up on the final stage to the Towers, but fitness definitely helps – we scaled 1100 flights of stairs in the 6 days, according to our pedometers. Daily distances are not too long, unless you do some of the optional climbs to some of the bigger lookouts at Los Cuernos (worth it!) – usually around the 16km mark. But one factor you have to take into consideration is the wind. I haven’t experienced anything like it – you hear the gusts coming before they hit you – it sounds a bit like a dozen diesel locomotives at full pace – and you know to ‘brace’ (seriously, as they reach up to 120km an hour. The lighter weights of us (not me!) were bowled over a couple of times, and one of our 9kg backpacks was tumbled along by the wind like it was a cotton ball. It’s impressive and very wild! We took the option of the boat out from Refugio Grey, rather than retrace our steps, and that was a good call. It takes you up to the face of teh wave-like Grey Glacier and past its various icebergs, and rewards you with a legendary Pisco Sour made with glacial ice as a nice end0-of-walk celebration. We also opted to stay a couple of nights in Refugio Grey at the end so we could do a day walk further up the pass, across some mighty suspension bridges (leave your fear of heights at home!) and clamber down to the iceberg-filled Grey Lake. This walk is seriously very, very beautiful. Seriously one of the best walks, and most varied, that I have ever done. It did not disappoint one iota. If you ever get the opportunity, grab it with everything you’ve got and go for it. Magellanic Orchids – just wow! I haven’t been to Amsterdam for 20 years, when I was all eyes and ears as a young back packer. And here I am, still all eyes and ears, for a weekend with a great buddy. 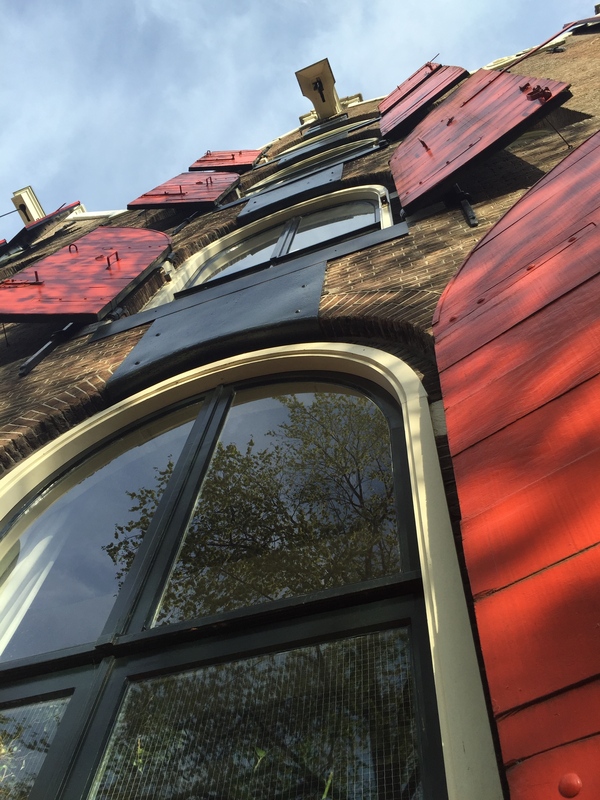 Amsterdam is an immensely strollable city – small enough to get lost in, gorgeous cafes and bars to pass the time, and a cacophony of sights and sounds for the senses. `And when your feet get sore or your nerves too jangled from avoiding the faster-than-a-speeding-bullet cyclists who own the city, you can just jump on a canal bus and see the city from water’s level. Even in the water it’s more than a slightly mad pace – hundreds of boats – pleasure cruisers, working barges, pedalos, private tubs, sleek little numbers carrying a couple of friends and more than a couple of drinks, even dinghies shaped like yellow clogs (I kid you not), and house boats lining every canal – all seem to mostly avoid collisions as they weave under the low bridges, and while there doesn’t seem much order to it all, it somehow works! 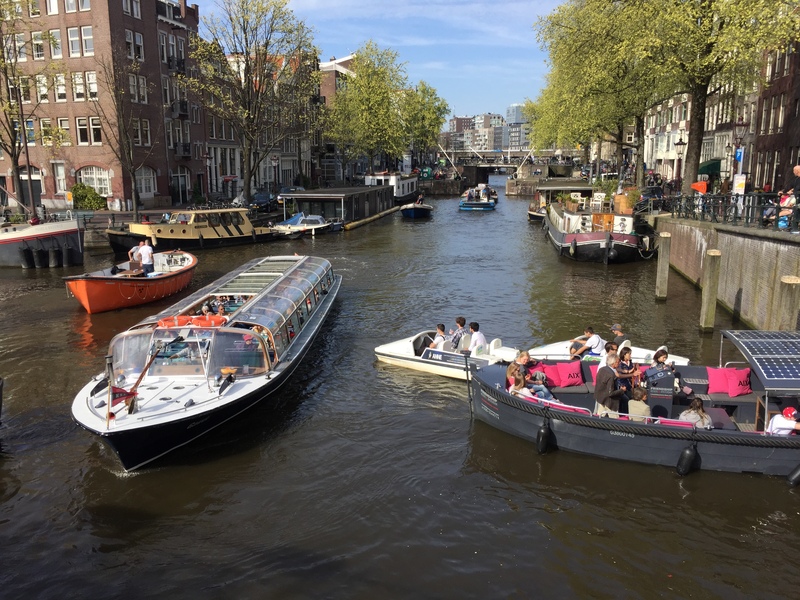 Tomorrow is Kings Day, so all the houseboats have put out buoyant floating barriers, to help prevent damage from the hundred of boats fuelled by fun and the colour orange, who will bump along the canals tomorrow as the town goes mad. Can’t wait! 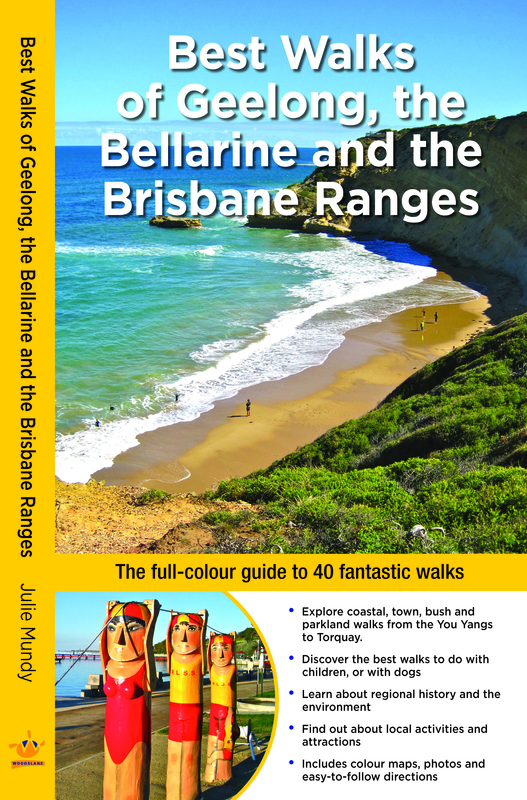 Just a quick post to let you know that the 2nd print run of Best Walks of Geelong, the Bellarine and the Brisbane Ranges is now available and in stock at Woodslane Press, so your local bookseller should be able to order it. Yay! Also, at the upcoming Melbourne Dog Lovers Show, on the first weekend in May, you’ll be able to pick up ‘Melbourne for Dogs’ at the show’s book shop, run by Avenue Bookstore. Amidst all that excitement, time for me to focus on the final write up of Best Walks of the Great Ocean Road, before my long-suffering co-author, Neil Fahey, over at Bushwalking Blog, falls asleep in disgust! Should be out mid year. Meantime, I am excited about my forthcoming birthday walk – 6 days on the Larapinta Trail – in central Australia. I love, love, LOVE deserts and one of my all time favourite travel moments was 4 days in the deserts of Wadi Rum in Jordan when I was doing that backpacker thang.